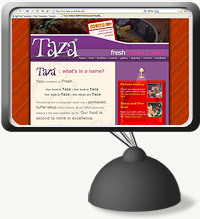 We came up with a fresh, modern design to showcase Taza's fantastic food and facilities. Our design is bold and colourful capturing the spirit of the Taza experience. The site theme is very similar to that of the restaurant itself. Taza is also much more than just your average Indian Buffet. It's a full on party venue as well and a really popular one at that. One of the centrepieces of this site is the picture gallery. Here Taza are able to upload multiple pictures from their party nights. We tweaked the gallery so that users could send links to pictures to friends driving more traffic to the site. Recently we were commissioned again by Taza to develop a customer loyalty system. This system works on a points basis. Points are added to customer accounts at the point of sale through bar-coded key fobs and a scanner. Customers can keep track of points online as well as being able to update their profile. Read Taza Manager, Vas Salimi's comments here.